I’ve been thinking about the power of names lately—how names shape who we are and how we think of things. A couple of weeks ago, an old friend from the Waldorf school was offering up eggplant like many a backyard gardener will do with zucchini. She caught up with me the evening of the school’s Michaelmas festival, one of my favorite festivals, which involves the changing of the seasons, an archangel, a dragon, stars, gnomes, peasants and royalty. “Hurry, come with me, I have them in my car!” I was urged in hushed tones as though we were about to conduct an illicit transaction. In the passenger seat of her sedan, my friend had five plastic grocery bags full of the dark purple vegetables. “I can’t get anyone to take them!” she said handing me the bag with the most eggplants. “Is that all you want?” she asked me. I didn’t want to be greedy, so I told her if she couldn’t find any other takers for what she had left to be sure and let me know. I wonder if the problem with eggplant isn’t contained in the name. The French don’t seem to eschew the bulbous nightshade the way so many Americans do, but in France they are les aubergines—a far lovelier name, as are most French nouns compared to their English counterparts (yes, in my opinion). A professor once told me that the impact of a book or movie is unknown until long after it has been read or viewed. What first impresses you may be easily forgotten in time. It’s been over twenty years since I read Gabriel Garcia Marquez’s Love in the Time of Cholera, a book I enjoyed when I read it (though I was troubled by the sexual predation of the character Florentino) and I still think of it regularly, like a journey I fondly remember taking. 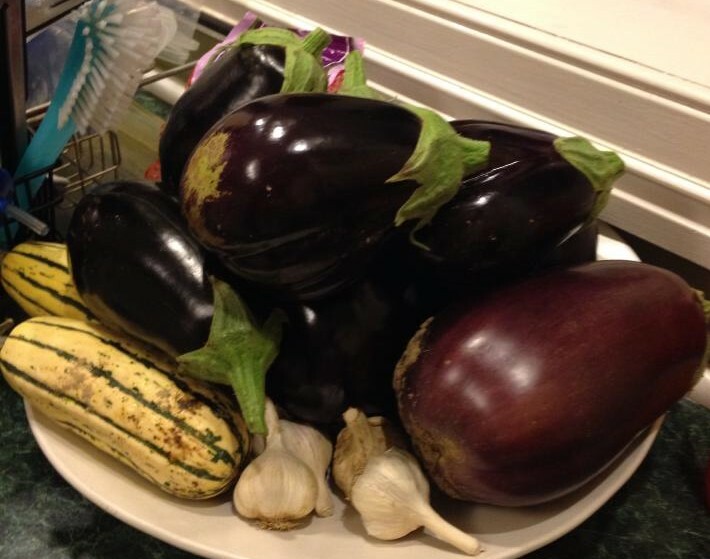 Eggplants—las berenjenas (also a far prettier name than ‘eggplants’)—are sprinkled throughout the novel. The character Fermina does not like them and promises to marry a man if he does not force her to eat the vegetable. Her family, however, intervenes and Fermina is instead married off to a physician from a high-ranking family, Juvenal Urbino. Like me, the Urbinos also love all things eggplant and for years, Fermina’s mother-in-law and sister-in-law frequently serve eggplant dishes just to torment her. But after decades with her husband, Fermina learns to cook and even develop a taste for the fleshy vegetable. Unlike Fermina, I have always love eggplant, but I did not grow up cooking it. I first learned to cook in my early twenties using the The Moosewood Cookbook, a collection of recipes from the Moosewood Vegetarian Restaurant in Ithaca, New York, published in 1977. Most of the recipes in that book are very accepting of adjustments (many of which I, frankly, have found necessary for a successful dish). I still have my original copy, though the front cover fell off long ago, filled with my notes penciled in next to the recipes I most often made: spinach lasagna (add two cloves of minced garlic to the filling), lentil soup (add ½ teaspoon each of basil, oregano, and thyme), and ratatouille (substitute 8oz. tomato sauce for the tomato juice). 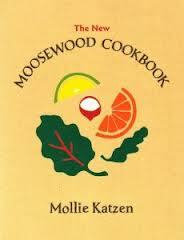 I believe it is because of The Moosewood Cookbook that I have always been willing to adapt recipes. I know it introduced me to cooking eggplant and I continue to follow it as a guide every summer when all at once eggplant, bell peppers, summer squash, zucchini and tomatoes come into season and for a month I make at least one large batch of ratatouille a week. No longer a vegetarian, I now add sweet Italian sausage to the summer stew. This year, our CSA grew okra for the first time and like the sausage, it too went into the ratatouille, adding a delightful texture to the dish. But it is no longer high season for all the ingredients in ratatouille and, after eating it from mid-August to late September; my diners were ready to go forego it for another eleven months. So what to do with an unexpected surfeit of these dark vegetable beauties? Moussaka. I thought I had a recipe I had printed out from the Internet some years ago, but I couldn’t find it. Though I often pore over my collection of cookbooks, which I weeded down to two shelves of my essential favorites when we moved, I researched the moussaka online. I love comparing recipes and the Internet has made doing so easy fun. 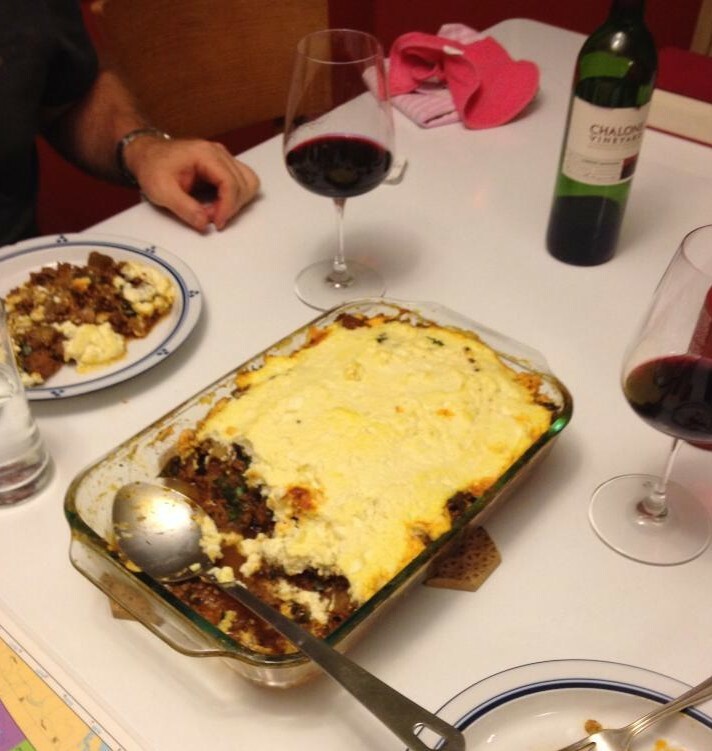 I Googled “easy moussaka,” because the last time Max followed an authentic recipe for the dish from one of our cookbooks, it took him three hours to put it together. It was fantastic, but I wanted a recipe that could be called “Working Mom’s Moussaka” (which describes all moms, but “All Mom’s Moussaka” doesn’t make the same, or any, point). When finished, I posted on Facebook before pictures of the eggplants and after pictures of the dish. I received several requests for the recipe and was, thus, inspired to write this post. A few things: I was not looking for a gluten-free recipe, but instead of the traditional béchamel sauce, I took the ricotta/feta/egg topping from Martha Stewart’s recipe, which has no flour in it. For the eggplant/meat body of the dish, you can use all beef, but I prefer a mix of 1/3 ground lamb to 2/3 ground beef. This gives it the creaminess and flavor of the lamb without being too rich for the mouth or the wallet. Finally, I make a large quantity because I feed many people. This serves us two dinners (when Claude is not home). But it can easily be cut in half. Or as a gift to yourself down the road, place it in multiple dishes and bake one now and put the other dish in the freezer (without the cheese topping). Finally, this recipe is mild enough to for three-year-old Leif and smooth enough for Lyra, who at 13 months has only four teeth. 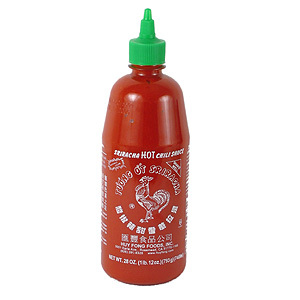 I slap a bottle of Sriracha on the table for the adults and feel it completes this dish’s umami. This moussaka has been so deliciously successful, I have made it two Sundays in a row and it very well may end up on this weekend’s menu, too. Add the eggplant and sauté until it softens (it will cook down), turning it over and over. To taste (perhaps 1-2 teaspoons each), sprinkle in cinnamon, salt and freshly ground black pepper along with the chopped parsley and mix in. Add the spaghetti sauce and diced tomatoes and cook 4-5 more minutes until hot. Transfer to the baking dish. In a medium mixing bowl, stir together the ricotta, feta and eggs (whisk eggs before adding to the cheeses) until thoroughly mixed. Blop it on the meat mixture in large dollops and gentle smooth over the top (like icing a cake). Bake 40-45 minutes until the topping is set and slightly browned at the peaks. This entry was posted in Uncategorized and tagged adapting recipes, easy moussaka, eggplant, Love in the Time of Cholera, Moosewood Cookbook, seasonal cooking, Working Mom's Moussaka. Bookmark the permalink. not worth it or one who is simply not into you. Remind him of the cheerful times you spent together.